Aqua 30 mil RPE liner with high puncture & tear resistance. AQUA 30 is a 30 mil reinforced polyethylene (30 mil RPE) consisting of the highest quality raw materials. This has ensured that Western Environmental Liner’s Aqua 30 has the best physical properties in the industry. In most situations, Western Environmental Liner’s Aqua 24 will get the job done for water and secondary containment, but when the strongest liner material is needed, Aqua 30’s puncture and tear resistance can survive extra wear and tear in unique liner applications that most liner materials can’t. 30 mil is also a requirement for many film (non-reinforced) products. These requirements are often not separated from reinforced products, so when this is the case, Aqua 30 is an excellent allowable choice. With Aqua 30 coming with a 10 year u.v. & weathering warranty, it can be used for most applications. 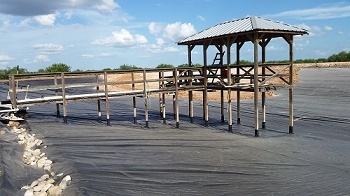 Some applications where Aqua 30 mil are used but are not limited to are, pond liners, frac pad liners, secondary containment liners, rig liners, long term liners, heavy duty covers, and tarps. For more information on Aqua 30 and other Western Environmental Liner materials, please contact Western Environmental liner by email or phone.